Jordan Romero climbed Mount Everest at age thirteen—and he didn’t stop there. In this inspiring young adult memoir that includes color photos, he tells how he achieved such great heights. On May 22, 2010, at the age of thirteen, American teenager Jordan Romero became the youngest person to climb to the summit of Mount Everest. At fifteen, he became the youngest person to reach the summits of the tallest mountains on each of the seven continents. 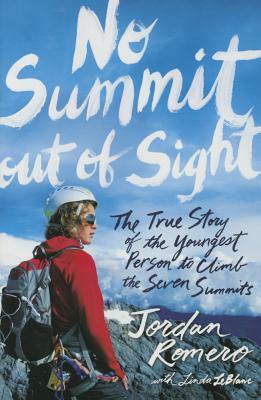 In this energizing memoir for young adults, Jordan, recounts his experience, which started as a spark of an idea at the age of nine and, many years of training and hard work later, turned into a dream come true. “The emotional pitch of the story remains high as Romero contends with extreme weather, frustration, exhaustion, and homesickness to reach, with almost palpable exhilaration, each peak” (Publishers Weekly). "Romero's incredible, inspiring story may not inspire all readers to become record-setting mountaineers, but it will motivate them to set sights on goals of their own to achieve." Romero’s incredible, inspiring story may not inspire all readers to become record-setting mountaineers, but it will motivate them to set sights on goals of their own to achieve. The emotional pitch of the story remains high as Romero contends with extreme weather, frustration, exhaustion, and homesickness to reach, with almost palpable exhilaration, each peak. Jordan continually reflects on the dangers and emphasizes the extensive preparation involved, and his excitement over each new mountain adventure is contagious.